From brazen helmet and warrior’s shield of the ancient world to the modern flashlight cell and galvan-ized steel plate, zinc has worked in the service of man. THOUGH it seldom makes headlines, humble zinc ranks with iron, copper, and lead as one of the most widely used metals in the world. Hundreds of thousands of tons of zinc are used annually as a molten dip to coat iron and steel pipes, tanks, and roofing for protection against corrosion. The process is known as galvanizing. Brass is made of about 30 percent zinc and 70 percent copper. Granular zinc and zinc dust are used in the laboratory to release hydrogen from acids, to recover gold and silver from solutions, and in organic synthesis. More than 500,000,000 zinc cases for use in electrical dry cells are manufactured every year. Made in great quantities by roasting zinc ores in a large excess of air, zinc oxide is important in forming other zinc salts, for ointments and dental cements, and as the paint pigment “zinc white.” Although zinc white lacks the covering power of white lead, it is not poisonous and is not discolored by hydrogen sulphide. Zinc is the only common metal having a white sulphide. Compounded with barium sulphate, zinc sulphide forms a still better white pigment, lithopone. Zinc chloride (caustic: “handle with caret) is used as a soldering flux, in manufacturing dyestuffs, in sizing and weighting textiles, and as a wood preservative. In strong solution it can convert the cellulose of paper and wood into soluble compounds, and is thus used in the process of making “vulcanized fiber.” Zinc stearate is commonly used as a baby powder. Because it is so active chemically, zinc never occurs free in nature. Its compounds, however, are widely distributedâ€”often mixed with the ores of other metals. As a consequence, zinc was used unwittingly for centuries before it was recognized as a distinct metal. By smelting zinc-bearing copper ores, the Romans, for instance, used zinc to make brass without ever knowing it. Zinc has often been confused with lead, tin, and bismuth. As an element, it has been known for only 200 years. The chemical activity of zinc may be spectacularly demonstrated. On the center of an asbestos mat mix together about lA tea-spoonful each of zinc dust and ammonium nitrate. Mix them gently, and be sure that both ingredients are dry; otherwise they may react prematurely. On top of the heap place a few grains of ammonium chloride, and stir in slightly. Then make a small depression in the top of the mound. Everything set, put just one drop of water in the volcano-like crater and stand back. In a matter of seconds, the zinc ignites and flashes with a brilliant blue-white flame accompanied by a cloud of dense white smoke. The single drop of water promotes a complex reaction that liberates ammonia, hydrochloric acid, water vapor, and nitrous oxide. Oxygen from the nitrous oxide unites with the zinc, forming white zinc oxide. This makes up the greater part of the cloud of smoke. Although chemically pure zinc reacts very slowly with dilute acids, a slight trace of some less active metal or impurity, such as is round in ordinary commercial zinc, causes the reaction to become rapid. A thin coating of mercury applied to nonpure zinc, however, dissolves some of the zinc and produces a surface that behaves as if the zinc were pure. This application of mercury, called amalgamation, reduces the wasting away of zinc battery plates when a battery is idle. You can demonstrate this difference in activity by amal-gamating a strip of commercial zinc and suspending it beside an untreated strip in a beaker of dilute sulphuric acid. 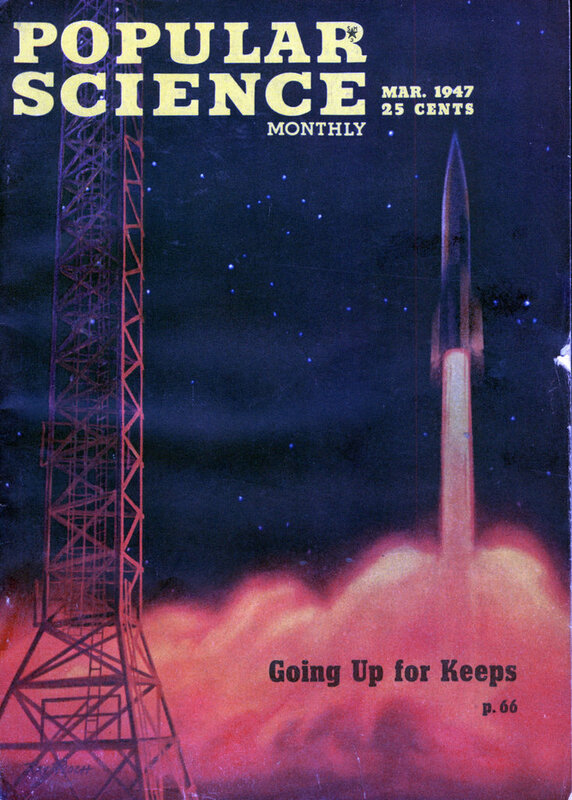 To amalgamate the zinc, first remove the surface film by rubbing with fine sandpaper or steel wool. Then, using a small wad of cotton, rub a drop of mercury over the faces and edges until they are uniformly coated. Now suspend both strips of zinc in the acid (one part sulphuric acid added carefully to five parts water will do). Bubbles of hydrogen in great volume arise immediately from the untreated strip, while the amalgamated piece releases almost no hydrogen at all. The untreated zinc is indeed acted upon so rapidly that it disappears completely in a matter of minutes. Because zinc is more electropositive than iron, copper,, or brass, small pieces of these metals can be electroplated “with other metals merely by placing them in contact with a zinc cup submerged in a hot plating bath. In this battery less plating method the zinc acts as an anode while the objects to be plated serve as the cathode. A weak current is set up between the two and causes metallic ions from the bath to be deposited on the cathode. To obtain a cup for the experiment, saw off the bottom third of an exhausted standard dry cell, empty the contents, , and puncture a number of holes in the sides and bottom to permit circulation of the plating liquid. Place the cup in an unchipped enameled pan or a large beaker over a source of heat. For a liquid with which you can plate copper on iron or steel, dissolve 15 grams of potassium bitartrate (cream of tartar), 6 grams of sodium hydroxide, and 4/2 grams of copper sulphate in 250 ml. of hot water. After thoroughly cleaning the objects to be plated, put them in the cup and submerge it in the plating fluid, which is kept hot to reduce resistance. The cup may be removed and drained in 10 or 15 minutes and the objects rinsed and dried. Zinc may be plated on iron and steel by the same method, but using a bath of 17 grams of zinc chloride and 5 grams of ammonium chloride in 250 ml. of water. To plate nickel on copper or brass, use 10 grams of nickel ammonium sulphate in 250 ml. of water. Because it stands near the top of the electromotive series of elements, zinc will replace most common metals when it is put into a solution of one of them. Practical use is made of this property when zinc dust or shavings are used to recover gold and silver from the cyanide baths employed in metallurgy and silver from exhausted photographic hypo. A fascinating demonstration can be performed by immersing a strip of zinc in a solution-of lead acetate. Fasten the strip to the cover of a half-pint jar,’ and then polish the strip with sandpaper or steel wool to remove surface film. Fill the jar with a solution of 30 grams of lead acetate in hot water, and screw on the top. If it is left standing overnight, next morning you will find in the jar a beautiful “lead tree” composed of a voluminous cluster of crystals of metallic lead. Part of the zinc dissolves, replacing the lead in the lead acetate and forming zinc acetate. Since the sulphide of zinc is the only sulphide of a common metal that is white (the others range from yellow to black), paint mixed with zinc salts remains white longer in atmosphere containing hydrogen sulphide than does paint mixed with white lead (basic lead carbonate). You can show this by pouring a little hydrogen sulphide water into clear solutions of zinc chloride and of lead acetate in water. Their salts transformed into sulphides, the zinc solution turns milky white, the lead inky black. A solution of hydrogen sulphide for the experiment can be made by bubbling some of this gas through water in an apparatus set up as in the photo at left below. The generator is a flask containing several grams of ferrous sulphide covered with water. The reaction is started when a little concentrated sulphuric acid is poured in. 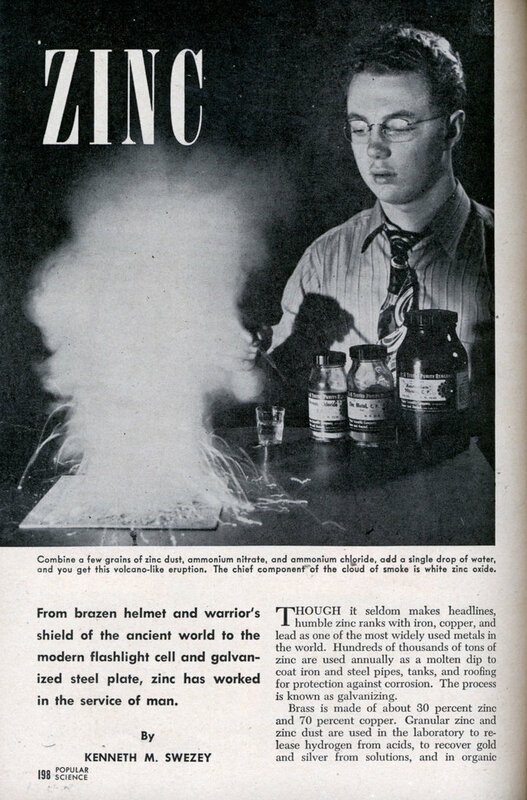 “From brazen helmet and warrior’s shield of the ancient world to the modern flashlight cell and galvan-ized steel plate, zinc has worked in the service of man.” Experiments with Zinc, Popular Science 1947 – Link……. This could be called “Fun with poisons” today. Remember kids, a zinc fume headache *really hurts*, mercury is toxic by fume, lead is toxic by ingestion/inhalation, hydrogen sulphide (rotten egg smelling gas) is highly poisonous (beware how it numbs the nerves in your nose so you miss it’s smell after a few minutes!) and H2SO4 is also nasty. Oh, and you might get arrested if you try to buy Ammonium Nitrate despite it being the safest thing on this list. Fireworks used to be illegal in NYC, as they still are. But they were tolerated, since one of the biggest boroughs is Chinatown, where you can still buy fake Rolexes and fancy “name brand” handbags, but as of five years ago their sidewalk displays of fireworks were finally cracked down upon. How? In truly Soviet fashion: vans with four horns on top of them, screaming out in Chinese and English that FIREWORKS ARE ILLEGAL. So you have to go to black and hispanic neighborhoods to see a good street show. Luckily I live two blocks from Spanish Harlem. Instead of buying fireworks in a drug-dealer fashion, we just bring beer to give to the kids who are setting the things off. The cops come to make a token “stop that!! !” announcement, then leave, so the show starts up again in five minutes. You can still buy strips of magnesium from Ebay, and that’s as good as a zinc volcano any day, especially if you powder it in a blender.